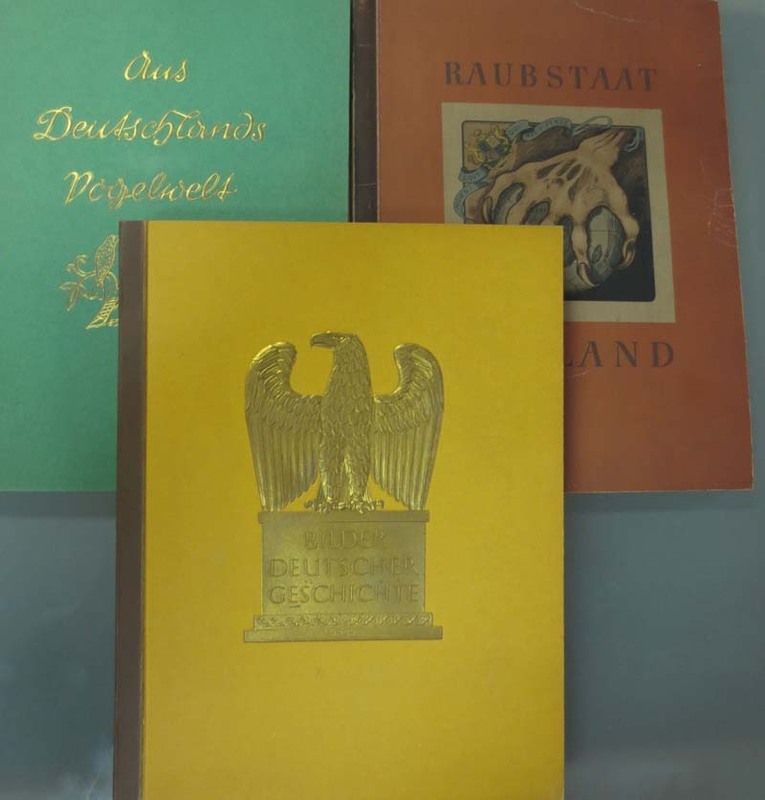 "Cigarette cards: Lot of 3 albums housed cigarette cards issued by Cigaretten Bilderdienst included “RAUBSTAAT ENGLAND (Predatory England)”, “BILDER DEUTSCHER GESCHICHTE (Pictures of German History)”, and “AUS DEUTFCHLANDS DOGELWELT (From Germany Bird World)”. Very nice. F.(3) "
"รูปยาซิกาเรตการ์ด: กลุ่มอัลบั้มรูปยาซิกาเรตการ์ด 3 เล่มออกโดยโรงงาน Cigaretten Bilderdienst ประกอบด้วย “RAUBSTAAT ENGLAND (Predatory England)”, “BILDER DEUTSCHER GESCHICHTE (Pictures of German History)”, และ “AUS DEUTFCHLANDS DOGELWELT (From Germany Bird World)” สีสันสวยงาม F.(3) "